Local officials from multiple organizations met last Wednesday to discuss a road safety plan for Champaign County. The objective of the plan is to address and prevent fatal and serious injury crashes in the local region. 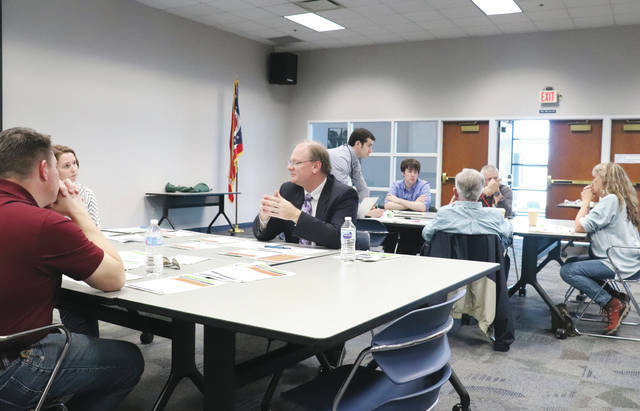 Representatives from multiple local organizations discussed a plan aimed at reducing fatal and serious injury crashes in Champaign County during a meeting last week. The involved parties initially met in February to discuss a road safety plan for Champaign County. When the plan is completed, it is expected to provide a framework to address and prevent fatal and serious injury crashes in the region. According to information provided at the meeting, nationally, over 30,000 people are killed in motor vehicle crashes annually and in Ohio, this number averages 1,000 per year. Last Wednesday, the discussion of addressing critical factors that contribute to crashes continued as those in attendance were broken into groups to discuss how to solve challenges involving young drivers, seat belt use, alcohol impairment and intersection crashes. Each of the four groups reviewed data and provided potential actions to lower the number of crashes related to these areas. Champaign County engineer Stephen McCall started working on putting a safety plan together before enlisting the assistance of other local stakeholders. McCall said these kind of safety plans have been worked on at the national level and state agencies like the Ohio Department of Transportation have been encouraged to look at local counties. A wide array of people from county government, local law enforcement and other local entities were in attendance for the meeting. Last week’s meeting was the last time the group was scheduled to meet prior to the development of the actual safety plan. McCall said a report containing recommendations, identifying locations in the county that need further studying, and opportunities the county can pursue for grant funding.